Huge Savings Item! 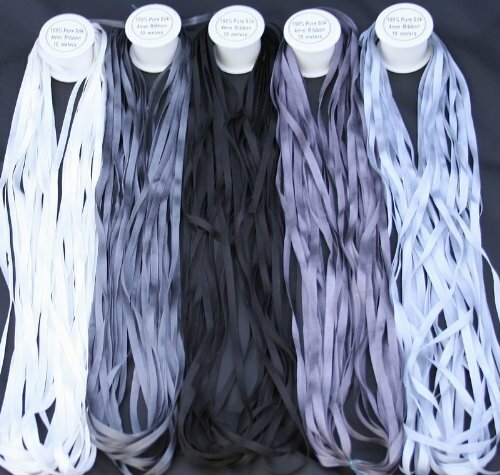 Save 13% on the New ThreadNanny 5 Spools of 100% Pure Silk Ribbons - GREY Tones - 50 mts x 4mm by ThreadNanny at dstclub.org. MPN: GREY_RIBBON_4mm. Hurry! Limited time offer. Offer valid only while supplies last. 5 spools of 100% Pure Silk Ribbons of 4mm size. Each spool has 10 meters of ribbon on it giving you a total of 50 meters (approximately 55 yards). 5 spools of 100% Pure Silk Ribbons of 4mm size. Each spool has 10 meters of ribbon on it giving you a total of 50 meters (approximately 55 yards). This set includes 5 different shades of GREY WHITE AND BLACK - No Duplicates. This is Best Quality Silk Ribbons and have a retail value of approximately $5.24 per spool, . The Ribbons come pre wound on their individual plastic container for easy storage. These Embroidery Ribbons have a beautiful sheen on them as seen in the pictures and will make your project stand out. Retails at $ 5.24 per Spool. Works Great for Brazillian Embroidery as well. View More In Fabric Ribbons. If you have any questions about this product by ThreadNanny, contact us by completing and submitting the form below. If you are looking for a specif part number, please include it with your message.